The face of passive-aggression is calm and agreeable, but beneath that exterior lies an anger deep, powerful, yet often unacknowledged by the person whose life it is undermining. Drawing on her experience in using mindfulness to release anger and express emotions honestly, renowned psychotherapist Dr. Andrea Brandt offers eight simple keys to understanding passive-aggression and eliminating its hold. Her approach includes the partners who are caught up in the passive-aggressive tango, providing a means to heal the relationship as well as the parties who are trying to love each other around the barriers that passive-aggression creates. Dr. Brandt’s approach includes advice for all participants in relationships characterized by passive-aggressiveness—spouses or romantic partners, friends, co-workers, bosses, employees, parents, adult children, or siblings. 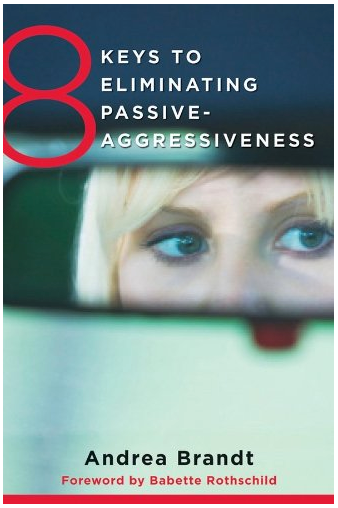 With illustrative anecdotes and multiple exercises, 8 Keys to Eliminating Passive-Aggressiveness provides a way forward for those trying to love each other around the barriers that passive-aggression creates.